Enjoy hiking in the Ligurian hinterland while visiting the town of Sciarborasca in Liguria, Italy. The St. Ermete Village Church, destroyed during the 2nd World War and rebuilt by parish priest Franceso Pastorino in the 1960s. 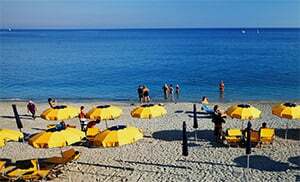 The "Festa Sociale" takes place every year during the first 15 days of July with the support of the Croce d'Oro, and this has over the years become a famous festival in Liguria thanks to the excellent food served during the occasion and the popular Italian comedians and orchestras. Originally known as "Ciarborasca", this town is located at the foot of Monte Beigua and is a popular starting point for excursions along the Alta Via dei Monti Liguri (AVML) high-altitude hiking trail which runs from Ceparana (Bolano) to Ventimiglia, always along the ligurian coast. It is part of the area under the Parco Beigua national park with many walkways. The Roman Street which ran through the hills of Cogoleto passed through Lerca and Sciarborasca. The town was once a transit point for the transportation of wood along River Orba for Liguria shipyards. Sciarborasca, which forms part of the municipality of the coastal town of Cogoleto, belongs to the province of Genoa. The town can be accessed by car from Cogoleto via the SSP 66, or by public bus. It is 213 m above sea-level and approx. 4 km from the coast.